Check out this Black Off Shoulder High Low Dress! The Black color is a classic and makes it super easy to mix and match with many accessories to make endless looks! Add this cute dress to your wardrobe now! elizabeth c. Reviewed by elizabeth c.
I picked this dress for my daughter’s graduation. It was perfect! The fabric was wrinkled when I got it but all I needed to do was to tumble it in the dryer for a few minutes. The wrinkles came right out. It is lightweight and I received many compliments on it. Its the perfect combination of simple and dressed up. Great summer evening dress. 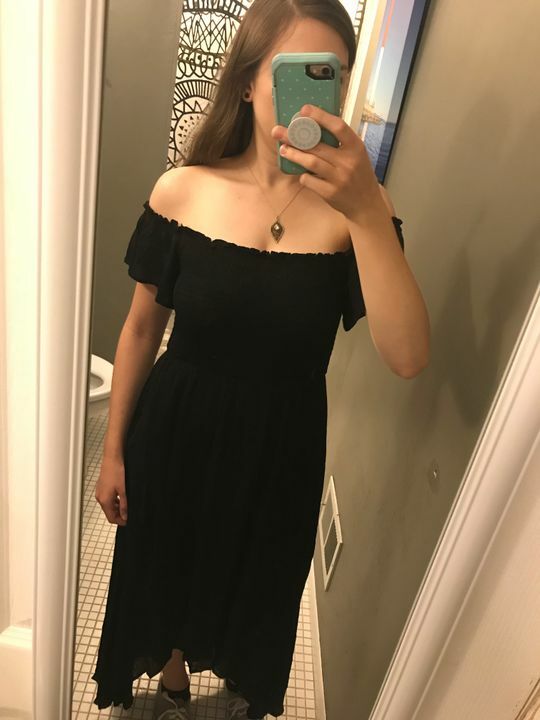 I wore the black off shoulder high low dress to an outdoor wedding with boots and western jewelry. The dress is a great length. Long enough to feel comfortable dancing in, short enough to show off your cute shoes. Also loved how versatile this dress is. I went western, but you could wear a pair of killer heels for date night at a nice restaurant too! Only issue - I have larger hips and the inner lining isn't the longest and the material rides up pretty bad. If you're going dancing - wear spandex underneath! I am extremely happy with my dress! I was concerned when ordering about how it would fit but, it is perfect! I bought it to wear to my daughter’s wedding in October. Now that I have it I am going to wear now and shop with y’all for a different dress for the wedding!